Cats like to explore and roam. I see a lot of indoor/outdoor cats that spend a lot of time sniffing every shrub they walk by, watching people, and listening and checking out everything. They would make perfect Neighborhood Watch volunteers if they were actually interested in something like that. But being cats, they do what they do and have a life and world that is sometimes a mystery to us. While your dog may willingly jump into your car and wonder where you two are going, your cat may give you a look and try to run back in the house or howl the whole time in a carrier expecting that the car ride means a horrible trip to the vet. There are some cats that adjust quite well to traveling and for those of us who are lucky to have such a pet (I’ve never had a cat that liked traveling or even cared what lay beyond the windowsill), then it’s important to make sure you have the right gear for your cat. Pet First Aid Kit – Bring along any medicines your cat will need to stay healthy and calm. That includes all of the pills he normally would take for the amount of days you’ll be away (plus a few extra pills in case you can’t get back home as early as planned). 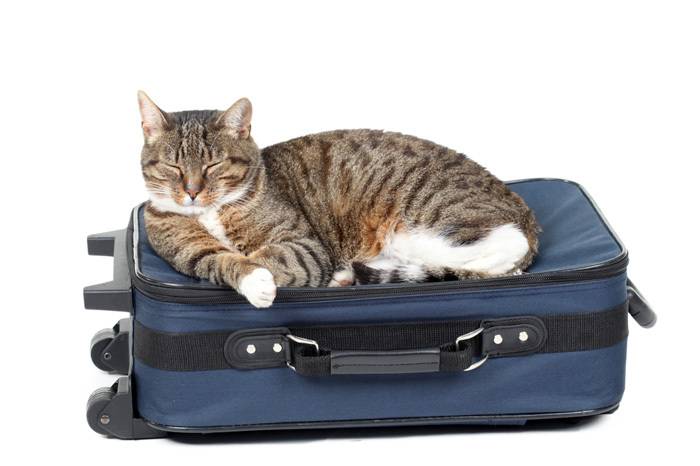 Talk to your vet about any other medications that you may need while away for your cat. Toys and Treats – since your cat might be going away with you, unwillginly, bring along some favorite cat toys, the yummiest treats, and a few other creature comforts to help your cat realize things are ok. Having familiar stuff around can help calm their fears and anxiety about being in a new place, in a car, and comfort them. My cats like to hide under a jacket or sweatshirt of mine when they have had to travel and will sleep on it the whole time we are not home. Cat Carrier – a good carrier that allows you cat to stand up, turn around, and lay down without being smushed in is important to have. It also needs to have good ventilation and should be strong enough to handle your cat. Some cats are fine in nylon shoulder bag type of carriers while others would tear a hole and be back inside in 3 seconds. For those cats, it’s best to get a hard plastic carrier with a stainless steel door, like the Petmate Pet Taxi Fashion Kennel. Disposable Litter Box – sure you can bring the one from home, but it’s a little… well, dirty and it’s so much easier to have a disposable littler box. It’s always nicer to travel home with less than you left with. Nature’s Miracle Disposable Littler Boxes are perfect for traveling and good for the environment. These along with your biodegradable litter and your hybrid car make for the perfect light carbon footprint vacation! Food and Water Bowls – It can be so easy to forget the simplest and most essential items, bowls, for water and food, as we hustle and try to remember EVERYTHING to pack. Collapsible Bowls are easy to pack, easy to store, and perfect for trips. They are also easy to use when your cat needs to have a little water and food while in the carrier. Identification – It’s always a great idea to have your cat microchipped and keep that information up to date with the company. But, a collar and tag is a quick and easy way for someone to realize that your cat is not a stray and might be lost. Make sure you get a tag and collar for your cat, in fact, get two or three. Cats have a talent for losing their collars. The best kind are break away collars. We plan on traveling this winter and of course, Sophie will be coming along. I’m a little nervous taking her, but we will be going to some campgrounds out west. This is excellent information and the more I read about taking my cat along, the more my mind is eased. My husband doesn’t think we will be able to get very far, but I have faith. LOL Thanks for all of the great articles on this site. I think a micro-chip is in order. Thank you so much! !